We know you care for your pets and love them. Now, we'd like you to meet some of ours. 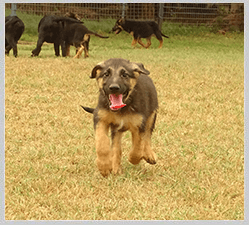 Smart and agile, Super Sniffers are specifically trained to track poachers and collect evidence against those who commit crimes against wildlife and nature. 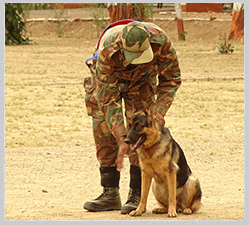 Show your care, donate to help us train and deploy more Super Sniffers to end wildlife crime, save our forests and our future. I would like to subscribe to the Panda express, a monthly e-newsletter, which includes news and updates on work done by WWF-India. All donations to WWF-India are eligible for 50% tax relief under section 80G of the Income Tax Act,1961. The mentioned asks are to illustrate the impact your donation can make towards our conservation initiatives. Based on pressing priorities, WWF - India may allocate donations received to other area/s where they are most needed. 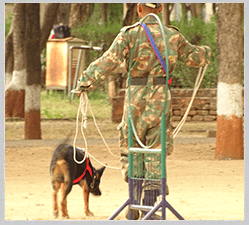 Sniffer Dogs to help stop wildlife crime were identified as a critical need among wildlife experts, which is why WWF-India began training sniffer dogs in top dog training centres in India. These canines are trained to detect tiger bone and skin, leopard bone and skin, elephant tusk, bear bile and other smells. 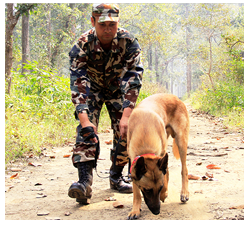 Till date, 7 batches (66 sniffer dogs along with handlers) have been trained and are actively serving. In the field, Super Sniffers have adapted their skill sets and are detecting an array of wildlife parts and derivatives including deer meat, live birds, snakes, porcupines, red sanders, turtles, tortoises among other wildlife. Since 2008, the Super Sniffer programme has really grown with various state forest departments requisitioning these super heroes to help fight wildlife crime. Today Super Sniffer squads are active in Andhra Pradesh, Andaman & Nicobar Islands, Assam, Bihar, Chhattisgarh, Haryana, Himachal Pradesh, Jharkhand, Kerala, Madhya Pradesh, Maharastra, Sikkim, Tamil Nadu, Telangana, Uttarakhand, Uttar Pradesh, West Bengal & Odisha. Its impossible to hide anything when Super Sniffers are around. Their super sensitive noses have 225 million scent receptors and that's why we are relying on them to protect India's wildlife. Their sniffing ability has been used to detect tiger bone and skin, leopard bone and skin, elephant tusk, bear bile and other smells. In December 2018, Sweety, a labrador, from our 7th batch of Super Sniffers has been commissioned to serve at the Kempegowda International Airport, Bengaluru. With one batch being trained every 9 months, our Super Sniffers are getting ready to serve against wildlife trade at airports across India.